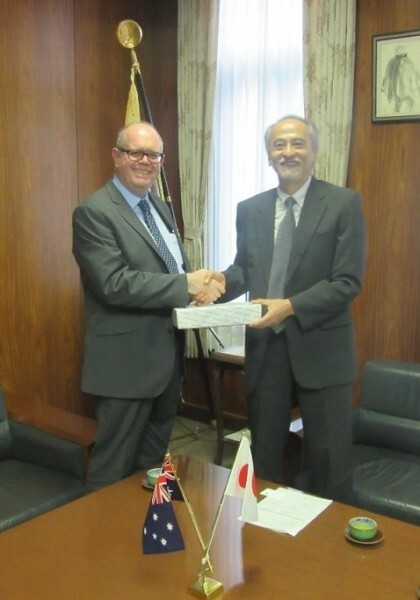 On August 19, 2015, Professor Andrew Parfitt, Deputy Vice-Chancellor (Academic) of the University of Newcastle, Australia, paid a courtesy call to President Shinji Harada and Trustee Yasumichi Matsumoto (in charge of Research and Social Contribution). 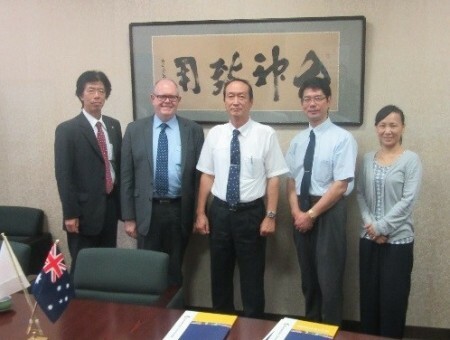 Kumamoto University has enjoyed a partnership with the University of Newcastle for almost 30 years, since 1986. Both universities have dispatched and accepted exchange students. Many Kumamoto students have gone to Newcastle to attend intensive language courses. President Harada and Deputy Vice-Chancellor Parfitt shared their views on topics such as exchanges among researchers and among students through the Top Global University Project and the Program for Promoting the Enhancement of Research Universities of Kumamoto University. The two sides agreed to further promote university-level exchange activities. 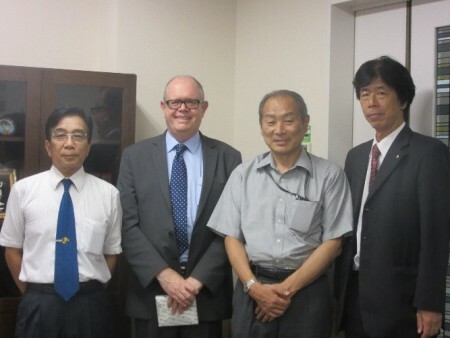 Deputy Vice-Chancellor Parfitt also met with Professor Jun Otani, Dean of the Graduate School of Science and Technology, and Distinguished Professor Takashi Hiyama. They shared views about academic exchanges in the field of natural science. 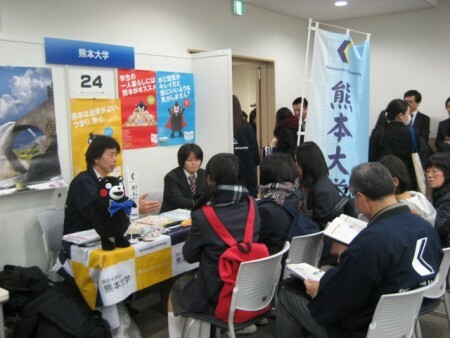 Kumamoto University will host a booth at the 3rd “Go Global Japan Expo”, a joint-conference and interactive event with Japanese universities currently participating in internationalization initiatives by the Japanese Government. This event is aimed at high school and university students with an interest in taking classes in English, studying abroad, or working abroad in the future. the 3rd “Go Global Japan Expo” homepage. The College of Cross-Cultural and Multidisciplinary Studies held its first “Summer Festa” on August 8 during Kumamoto University’s Open Campus. 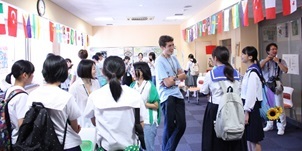 Over 100 high school students from over 30 different high schools around Kyushu came to enjoy the events, which included presentations from Japanese university students who have recently returned from study-abroad, international exchange games, and a Skype session with Japanese students currently studying abroad at Newcastle University in Australia. 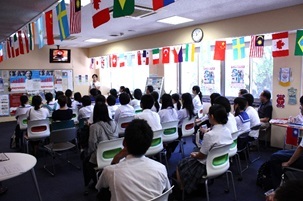 High school students who participated were able to talk directly with international exchange students as well as Japanese students with study abroad experience, giving them the opportunity to explore their options and deepen their interest in becoming global citizens. Summer Festa is one part of Kumamoto University’s “Kumadai Global Youth Campus”, a new project which strives to bring international experience and education to the future students of Kumamoto University. Kumamoto University’s Summer Program 2015 welcomed 36 students from China, Korea, Taiwan and the U.S.A. to Kumamoto University for two weeks of university lectures, educational excursions and cultural experiences. 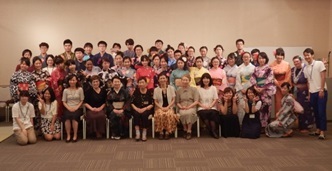 On August 4, the program’s participants were instructed by the Contemporary Japanese Dress Volunteer Group on how to wear yukata, traditional summer clothing. The Kumamoto University International Exchange Support Volunteer Group also assisted with the event, helping with hair and makeup and also furthering the international exchange that began with their hosting the program participants for a day of Japanese cultural experience earlier in the program. 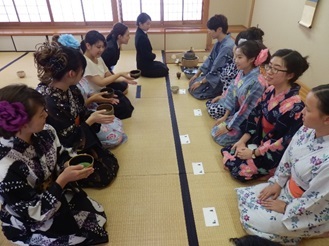 Kumamoto University’s Tea Ceremony club provided further cultural enrichment through a demonstration of tea-making, and also provided an opportunity for the international students to take part in the ceremony. The concerted effort and kind instruction from each volunteer group resulted in an unforgettable experience that these 36 international students will keep with them for the rest of their lives. 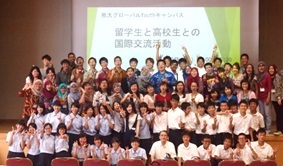 On July 29, 2015, 36 international students – participants in the 2015 Summer Program in English at Kumamoto University – joined 33 high school students from around the prefecture for an international exchange event as part of Kumamoto University’s “Global Youth Campus” project. The international students came from Indonesia, Vietnam, Thailand, and Malaysia. 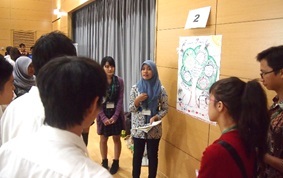 The high school participants joined us from Daini High School, Aso Chuo High School, and Kamoto High School. During the event, the 36 international students first gave short presentations based on their lectures about and experiences at Lake Ezu, Suizenji Park, Kumamoto Castle, Mt. Aso and Minamata. In the second half of the event, the high school students and international students enjoyed free conversation regarding international culture, language, and experiences. We are looking forward to creating more opportunities for the youth of Kumamoto Prefecture to experience global education and interaction through Kumamoto University’s Global Youth Campus. 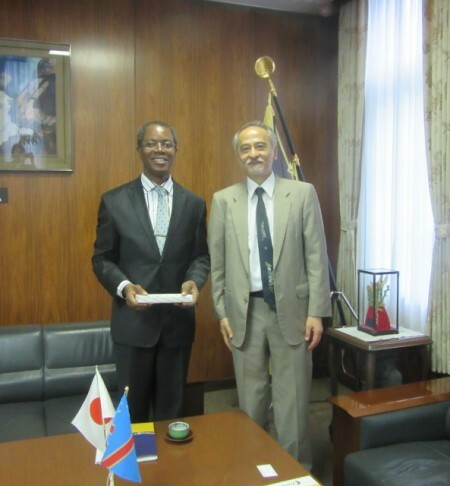 On July 27, 2015, Professor Tumba Ghislain Disashi, M.D., Ph.D., and Rector of the University of Mbuji-Mayi (Democratic Republic of the Congo, Africa) paid a courtesy call to President Shinji Harada. The University of Mbuji-Mayi is located in Mbuji-Mayi, the capital of East Kasai Province in the middle of the Democratic Republic of the Congo. Half of its 1,800 students are medical students. Rector Disashi studied at the Graduate School of Medical Sciences of Kumamoto University from 1992 to 1997, and obtained a doctoral degree. This visit was realized in accordance with Rector Disashi’s strong desire to deepen relations with his alma mater, as a first step to promote inter-university exchange activities focusing on student exchange with Japanese universities. During the visit, President Harada and Rector Disashi exchanged opinions regarding future exchange programs for researchers and students, and agreed to develop exchange activities between the two universities. 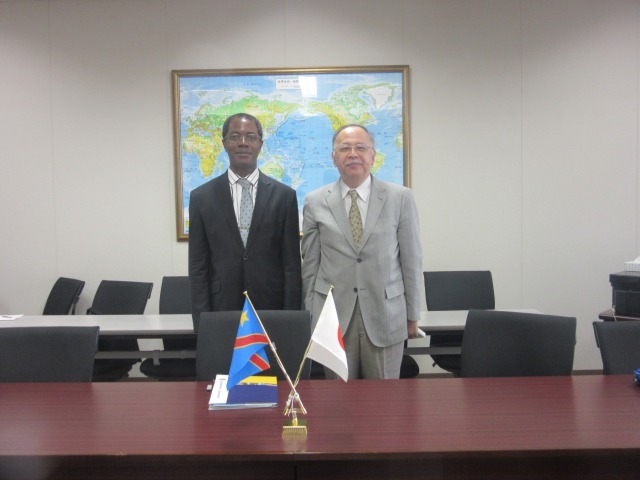 Prior to the courtesy call, Rector Disashi visited Honjo Campus and met with Professor Yasuharu Nishimura, Dean of the Faculty of Life Sciences. They discussed student exchange programs in the life science field. Rector Disashi also visited facilities such as the Department of Medical Engineering Center of Kumamoto University Hospital, the Center for AIDS Research and the Institute of Pulsed Power Science. Rector Disashi was surprised to see how much Kumamoto University had transformed since his last visit almost 20 years ago, and he expressed a strong interest in its attractive education and research environment. He said he hopes to build a good relationship with Kumamoto University in order to develop future high-level educators in Mbuji-Mayi.